Gladiator (2000): Dir. Ridley Scott. Written by: David Franzoni, John Logan, and William Nicholson, from a story by Franzoni. Starring: Russell Crowe, Joaquin Phoenix, Connie Nielsen, Oliver Reed, and Djimon Hounsou. Rated R for intense, graphic content. Running time: 155 minutes. The Academy entered the new millennium by honoring the old standards: specifically, the sword-and-sandals epics of Hollywood history. Scott’s reimagining of second-century Rome hearkened back to old Hollywood while offering a grittier, more violent approach than Ben-Hur or Spartacus. The gladiator of the title begins as one of the Emperor’s greatest generals, a brilliant soldier and tactician named Maximus. Deceived by the Emperor’s son Commodus, Maximus pursues a course of retribution to avenge the deaths of his wife and son. To do so, he must rise through the ranks and fight through any obstacle as a slave to the games. Ridley Scott seems intent on getting all the aesthetic details right with this film—it’s a shame, then, that the whole thing feels so shallow. The characters never rise above the familiar archetypes, and their relationships feel tenuous at best. The film is remembered more for its combat scenes, which still impress with their execution and choreography (even though they’re severely over-edited). An arena recreation of the Battle of Carthage puts us right in the action with key close-ups and great sound design. Yet we can still remain invested thanks to the quality of the acting. 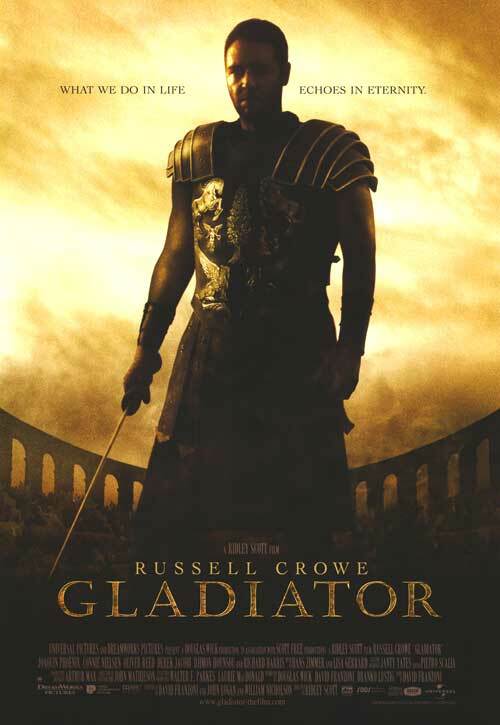 Russell Crowe is never less than credible in the role—he’s significantly smaller in stature than the other gladiators, but brings raw charisma and a wry sense of humor to both dialogue and combat. The cast boasts a who’s who of great British actors, including a scene-stealing Oliver Reed as Maixmus’s promoter, Proximo (who passed away during filming). Special note must also be given to Connie Nielsen and Djimon Hounsou, who shine despite their underwritten characters. Personally, I prefer Ridley Scott’s science fiction sagas to his historical epics . There’s enough great production value to sink your teeth into here—I just wish it were more substantial.